SJ Wedding Invitations London » Wedding invitations and stationery in London with a bespoke design service. Wedding blog. Our Black Friday Sale is now on! We are offering a 15% discount across our entire range of wedding invitations and stationery. It’s a perfect time to send out your wedding save the dates cards. Why not pop them in with a Christmas card to all your guests? What better way to announce your wedding and offer seasons greetings at the same time. The 15% discount also applies on a deposit made on an order. 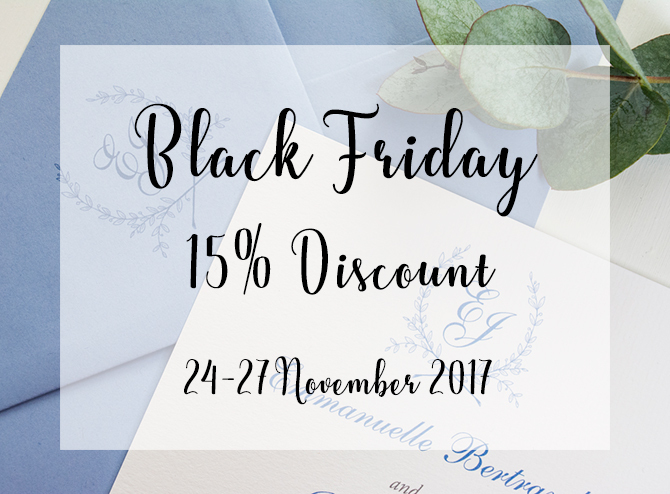 So if you are not quite ready to purchase your stationery just yet, you can place a deposit on your order and we will still give you the 15% discount once you have all your wedding details in place. That way you can relax for the Christmas season in the knowledge that your wedding stationery will still be discounted once you are ready to place the full order. The best way to browse through our latest stationery collections is to visit our ETSY SHOP. The 15% discount is applied to all our stationery designs. You can order samples on Etsy and view all of our latest designs. Or you can view our range from the Letterpress of Cirencester. If you are looking to place a deposit on an order or place a full order just email us: info@sjweddinginvitations.co.uk or call us on 0780 372 7248, with your details and we will set up a custom order for you. All of our designs can be customised in any way you wish with different card colour and texture, different ink colours, font and artwork – anything can be changed to suit your personal wedding theme. And if you don’t find the design you are looking for, just give us a call or pop us an email and we can make something entirely bespoke for your wedding day! Happy Shopping! We look forward to working with you to design your perfect wedding stationery suite. More and more of the clients I see are choosing to abandon the Great British weather gamble and head off to beautiful beach destinations for their wedding day. Looking out of my window on this rainy, November day I can see why! The ‘Palm Beach’ design is a great way to incorporate palm trees, sea shells and natural hessian and twine to give a rustic, beach theme, at one with nature. 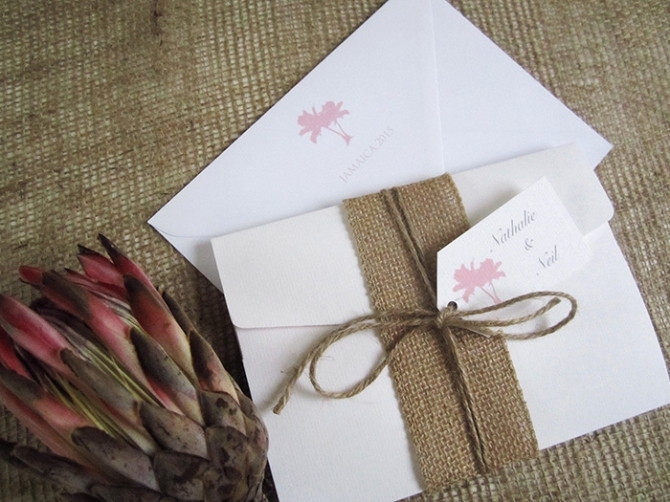 This rustic design incorporated palm trees as it’s central theme with a hessian belly wrap, finished off with twine and a personalised tag. Shown here in white laid card in blush pink and grey colour combination, the invitation is available in many different colourways and card. 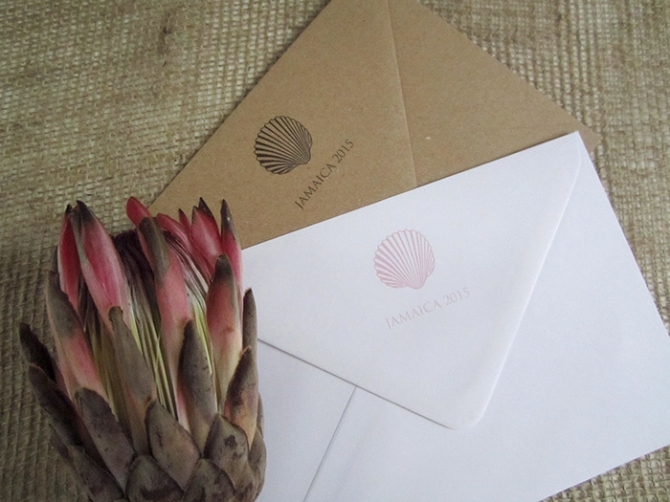 The envelope is printed with an image of sea shells, palm trees or another logo of your choice on the reverse and nicely finishes off the tropical beach theme. You could have your names and wedding date if you prefer or even a destination ‘stamp’. Envelope lining is also available. Add RSVP, or insert cards with gift list, directions or accommodation information for your guests so that they have all the information they need to jet off on the perfect wedding holiday. If you like the design but would prefer it without the pocketfold, this design is also available in a flat style rustic invitation stack, tied with twine and a tag. The invitation can be adapted to your preferred style and is available in many different colourways. The palm tree design can also be changed to sea shells or another beach destination motif. Choose your own font and ink colour to compliment your chosen design. Matching save the date cards, order of service, place name cards, menus, table seating plans and other stationery also available. A complete stationery suite is also available in this design. Contact us for more details. One of the most common questions I am asked by bridal couples is to explain the different printing techniques that are possible and what affect that will have on their finished stationery – as well as on the price of their stationery suite! Many different printing techniques are available and can make a dramatic difference to your design. Techniques such as letterpress or raised print will give a lovely tactile finish to your invitations and will certainly add a touch of luxury. Metal foiling will also add shine and a touch of drama to any stationery suite! So which printing method should you choose and what is the difference in cost? We have outlined some of the common printing methods below to help unravel the mystery of stationery printing. Probably the most common choice of printing, digital printing is the most flexible and cost-effective of all the printing methods. This method uses a digital file to reproduce a full colour image. The card is not required to go through the printing press four times as it is when printed lithographically, but only once. This makes it an ideal method for short print runs or when cards need to be persoanlised with guest names as each card can be printed separately. This would not be cost-efficient with the other printing methods. This method is used for printing invitations with guest names, personalised place name cards, table plans and any other personalised cards. The disadvantage is that certain types of card cannot be used to pass through the printer eg very heavy board. Lithoprint is used by commercial printers to print full colour brochures and many other print products. For this printing method a plate is made first and the card must be printed four times using different coloured inks – cyan, magenta, yellow and black – to produce a full colour print. This method is more suitable for larger print runs and does make it more expensive as the card must be passed through the printer 4 times. It also means that personalisation of individual cards is not cost effective. The quality can be better than digital if you are using large areas of colour on your invitations. This is a more expensive method of print than digital unless you require thousands of cards. This is a traditional printing method that has grown hugely in popularity in recent years, particularly for wedding invitations and stationery. For this method a plate with the image standing proud of the surface is inked and then impressed onto the paper. This gives a card a slight debossing effect (indenting) where the ink is laid. Designing for letterpress today begins on a computer, and as such, new fonts, embellished ornaments, graphics, patterns, and complicated multi-colur designs can be produced with relative ease. The printing part is still by hand, one at a time. This method of printing is labour intensive and has high initial printer setup costs which means it is more suitable for larger print runs. It also means that personalisation of individual cards is not cost effective. The cost is usually much higher than digital printing. Engraving, also known as die-stamping or copperplate printing, dates back to the 15th century. This is the process by which text or an image is first etched by machine or hand onto a copper or steel die. This die is then used to stamp the sheet, pushing the surface of the paper or card up, creating a raised image. Intense pressure is applied simultaneously with the application of ink, creating a raised image or text in the chosen ink colour. The result is a very impressive but can be a very expensive printing method. This historical printing process was the first method used to create a raised image, and now has largely been replaced by thermography which is a more cost effective method of producing the raised print effect. This is also known as ‘raised print’ as is produces a raised surface to print. Powder is sprinkled onto the ink when still wet. Heat is then applied which fuses the ink and powder to create the relief effect. Tios is much more cost effective than engraving and to the untrained eye produces the same effect as engraving. Traditional designs such as our Classic and Park Avenue designs use this printing technique to add a depth of elegance and luxury to the card. Hot foil printing is very similar to letterpress printing. Rather than ink, heat is used to transfer colour pigment (usually gold or silver foil) onto the paper or card. This is perfect for adding shiny foiled designs to your invitation and gives a really luxurious look to the card. Silver, gold or other metallic foil can be applied to the edge of card to make it more attractive. The thicker the card the better the effect. Bevelling (angled cut to edge of card) can also be used to show gilding to best effect. This technique is shown to great effect on our Gilded and Insignia designs. An area, usually square or rectangular that is embossed into the card. The thicker the card the better the effect. A good example of this is with our Bond St designs which are all heavyweight boards. An impression stamped forcefully onto card creating a relief effect. No ink is used in this process. This produces a lovely tactile feel to the card and is a very subtle and understated way to add luxury to your card. Lavender is such a beautiful flower with it’s gorgeous scent and subtle pastel colour tone. Lavender would be perfect for a rustic summer wedding or country garden wedding theme and can be used throughout the wedding to add beautiful colours and aromas to your wedding day. You can add lavender imagery or fresh and dried lavender flowers throughout your wedding theme from the save the date cards and invitations to the bridal bouquet, church flowers, wedding breakfast and even thank you cards! 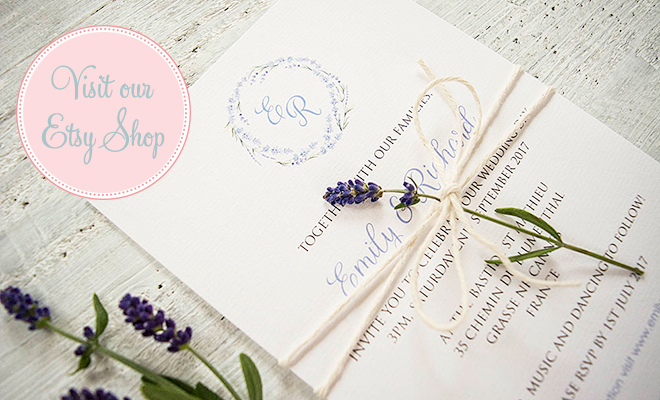 Our ‘Lavender Love’ design is the perfect way to announce your wedding. The lavender theme runs throughout the whole wedding stationery suite and includes a lavender motif, fresh lavender flowers and your own personalised lavender ‘travel stamp’ with your names, wedding venue and wedding date. The stamp would incorporate perfectly with a destination wedding – perhaps a rustic French chateau with fields of lavender! The lavender invitation is tied with twine and you could add a fresh or dried sprig of lavender for a special rustic feel. The card is 5x7in (other sizes available) and you can choose from white or cream card in smooth or laid textures or brown Kraft card for an even more rustic effect. The invitation comes with two insert cards included and an unlined envelope in white or ivory as standard. The back of the envelope is printed with the personalised ‘travel stamp’ incorporating the lavender motif, bride and groom names, wedding date and venue. Envelope lining is also available. Add RSVP, or insert cards with gift list, directions or accommodation information for your guests. ‘Lavender Love’ is also available in a rustic pocketfold style, with hessian band and tied with twine and tag.